Skip the background, what can I do right now? Originally due to be installed in 2015-2016, the Downtown Bike Network included protected bike lanes on Centre Street, Madison Street, and Maryland Avenue, and standard bike lanes on Monument Street, Preston Street, and Biddle Street. Maryland Avenue was installed, but the remainder of the network has been on a construction halt since Spring of last year due to complaints from the Baltimore City Fire Department, which is requesting 26 feet of clear street width on protected sections of the network. It is possible to re-design an east-west, fully-separated, all-ages facility within the Baltimore City Fire Department constraints, but it would likely remove parking. The city has extended the construction halt as long as they can, and construction must continue this Spring or we risk losing the contract and spending significant additional resources. As a result, we support the concept of a re-design to address Baltimore City Fire Department's unreasonable constraints, but believe whatever is installed must maintain a separated, all-ages design from project limit to project limit. Maryland Avenue looks finished. But technically, the job hasn't been closed out. There is still some paint to be laid. As a result, it is still in limbo. Baltimore City Fire Department claims it fails to meet their fire clearance requirements. On large portions of Maryland Avenue, protection would need to be removed to meet those requirements. We oppose making changes to Maryland Avenue because it is a NACTO compliant, nationally recognized bike lane and because other projects that were installed during the same time period are not being threatened in a similar way. Bikemore has long advocated for a road diet on Roland Avenue, reducing the street to one travel lane in each direction. This would allow for a wide parking lane and a wide, all-ages bike lane that is protected from moving traffic by parked cars. Data shows a single lane of travel is enough to accommodate the volume of traffic Roland Avenue sees every day, and that this is the best opportunity to reduce the frequency of which cars dangerously speed along the corridor. Baltimore City Department of Transportation opted not to pursue a road diet in their original design of Roland Avenue. As a result, the bike lane is too narrow, parking is too narrow, and the remaining two travel lanes still encourage dangerous speeding. Neighbors rightly complain about these conditions. For the past year, Bikemore has worked alongside Roland Park Civic League and stakeholders along the corridor to advocate for changes to make Roland Avenue safer for all road users. It's clear that the only design that could address speeding cars, narrow lanes, and maintain an all-ages bike lane is a road diet that keeps the bike lane against the curb. This option was recently presented at meeting in Roland Park, but a vocal contingent of residents is demanding that instead of a road diet, Roland Avenue should simply be returned to the original condition of two travel lanes with parking against the curb. This would solve none of the safety complaints, because it would keep two wide travel lanes for speeding cars and remove protection for people on bikes, forcing them to ride next to or in traffic with those speeding cars. Kids would no longer have a safe way to bike to school. It would be a choice to value the convenience of parking 8 feet closer to the curb over the lives of neighbors. We support a road diet that slows down cars, widens parking lanes, and keeps a protected curbside bike lane where people of all ages can safely ride a bike. Covington Street is another project that was beginning design when this drama began. It is still proceeding. The goal is to make a parallel all-ages biking connection to Key Highway, connecting from the soon-to-be expanded Jones Falls Trail at the Inner Harbor to Riverside Park. The current design is only protected adjacent to the American Visionary Art Museum. It changes to sharrows (painted bike symbols on the road) to the south. Sharrows are not bike infrastructure. They are for wayfinding. This fails the goal of an all-ages connection. We support the extension of the protected facility or the installation of speed humps and other bicycle boulevard treatments to ensure the entire facility, especially the part in front of Digital Harbor High School, is all-ages. Tell me about the Fire Access Issue. When a vocal minority of neighbors began to look for ways to fight against the installation of Potomac Street, they engaged the Baltimore City Fire Department on a piece of city-adopted International Fire Code that requires 20 feet of clearance on Fire Apparatus Access Roads. This piece of adopted IFC had not previously been applied in street reconstruction. Other portions of city-adopted IFC require 26 feet of clearance on Aerial Fire Apparatus Access Roads (streets with buildings over 30 feet) and 26 feet of clearance on streets with fire hydrants. We've been assured that these rules are to be enforced on all street reconfiguration, not just street reconfigurations with bike lanes. However, we have yet to identify a piece of infrastructure without bike lanes that has been halted or threatened, and many non-compliant projects have proceeded including the Preston Gardens reconstruction that occurred over the past year which features just 12 feet of clearance adjacent to a several hundred foot tall building. We demand that any resolution to the fire access issue be clear and fairly applied to all street reconstruction and retrofit and all new building construction and retrofit in Baltimore City per the requirements of the International Fire Code. Any resolution must encourage urban street design based on national best practices that reduce injury and death of vulnerable road users. With our policy director away on vacation, we are going to skip writing a longer post analyzing the final design for Potomac Street and what it means long term for Complete Streets and bike infrastructure in Baltimore today. But know that it’s coming. We did want to share our perspective on Department of Transportation’s decision and share the final design. DOT hosted an Open House to share the feedback received from the latest round of community input on a design meant to address Canton residents’ and BCFD’s concerns around fire access. The design that will move forward will be the one presented at the last community meeting. The revised design retains a two way bike lane, removes street parking from the West side, and changes East side on street parking from parallel to rear angle. Bikemore has maintained that with a few tweaks to improve emergency vehicle access, the existing design that is currently in the ground would work. But we also believe in compromise when possible, and while we still believe that 20ft clear access for emergency vehicles is not necessary or always appropriate in urban environments, it was important to move forward. This design addresses concerns around fire access by creating 19ft of clearance. Additionally it addresses neighborhood concerns around parking loss by maintaining roughly the same amount of parking as the original design by changing it to rear angle parking. Most importantly the revised design maintains an all ages, high quality two way bike facility--which was the original intent of the project. Potomac Street was the biggest fight we’ve ever taken on. Our small staff and dedicated volunteers and attorneys put in many long hours. We sued the city. We stopped the arbitrary removal of a bike lane based on nothing more than a handful of resident complaints (loud ones, but not in the numbers they reported to have). We forced stakeholders and the city back to the negotiating table to think through a thoughtful redesign. We stood firm in our stance that we cannot go backwards, that Baltimore desires and deserves high quality bike infrastructure, and that we cannot allow every public project to improve mobility in this city — whether it’s bike lanes or bus stops — to become derailed when some neighbors don’t want to see change in their neighborhood. In this latest round of community input to respond to the redesign, DOT received 560 emails. Of those 447 supported the Potomac Street redesign. 113 did not. What’s more, what became the rally cry for redesign — emergency access — received only 16 comments out of a total of 560 emails. Concerns over parking loss received 75. It confirmed what we always knew. That backlash to bike lanes is about nothing more than people placing their personal convenience over public safety and mobility. Community input is important. No community should ever feel as though a project is being placed upon them without listening to their concerns. But after multiple meetings, and a litany of press, Potomac Street has arguably received the most attention of any eight blocks in the city. The concerns around safety were addressed. Other concerns like parking were accommodated as best they were able. We are satisfied with the outcome. We are looking forward to being able to focus our policy work on Complete Streets that looks at how to prioritize the safety and mobility of people on all city streets, in every neighborhood. This was a decisive win for people who bike. Not because Bikemore is some inside influence with tons of resources to bring to the table like some would claim, but because of you. Our members. Your letters were inspiring to read. You showed up when you were called to, you were bold in your position for safe streets for all users, and gave generously to allow us to focus all our efforts on the issue at hand. We have a long way to go before Baltimore is truly safe and accessible for people of all ages and abilities to ride a bike. But we are closer today because of your support. We need your continued support to keep us moving forward. Please consider making a recurring donation to Bikemore. Whether it’s $10 each month or $1000 a year, you can be certain that your dollars are helping to build a force for biking in Baltimore. We look forward to having you join us as we continue to #fightforbikes. Last night, Baltimore City DOT presented a revised design of the Potomac Street protected bike lane at the Canton Community Association meeting. The majority of the room was in support of a protected lane on Potomac, because people like you showed up and spoke out. So, thank you! The revised design maintains a two-way, all-ages, high-quality protected bike lane. It addresses any emergency vehicle access concerns. It adds loading zones. It maintains parking. You can view the redesign on the Baltimore City DOT website here. DOT has launched a 30 day comment period on the revised design, and we are asking you to email comments in support. DOT will disregard template emails, so make sure to customize the subject and write your own comments in the email body. Please be sure to mention the importance of the lane remaining an all-ages, high-quality, protected design. We'll provide a longer update on the meeting at a later date. Thanks, and keep up the #FightForBikes! This summer we spent considerable time and resources ensuring that a high quality, all ages bike facility championed by residents was not removed. That was only possible because you—our supporters—were galvanized and took action. Next Tuesday marks an important next step in ensuring the success of our action. The Department of Transportation will present the revised design to the community at the Canton Community Association meeting. We are asking you to turn out. And most importantly, be vocal during the meeting of your support of the project. As part of our settlement with the city, we have been instructed to not to share the design in advance of the meeting. The public—including our members—still needs a chance to be involved in the process. What we can say is the new design has taken into consideration the concerns raised by some folks who live in the neighborhood, received the approval from the Fire Department, and has the support of the Mayor’s office and DOT. During this process, we were discouraged but not surprised by the divisive rhetoric put forward by those who wished to see the lane removed. It’s challenging moving Baltimore forward on issues regarding safety and transportation. When change happens, those opposed resort to a type of fortress mentality, a belief that only they should have input into changes in their community. What this ignores is the many people who are their neighbors that have been supportive of the project since the beginning. They paint Bikemore as some special interest group (their exact words)—as if improving the safety of all road users, and increasing opportunities of mobility is somehow nefarious and does not in fact have well-documented benefits on the community as a whole. Even throughout the legal process we had to constantly remind those on the other side of the table that this argument was not residents versus people who bike—but that the people who bike are in fact also residents who happen to have an opposing point of view. Yes, we organized and formed an advocacy group to champion that point of view—because as evident by how behind we are at achieving progress in multimodal planning—our interests were not well represented. Opposition will also state that Bikemore engaged in some secret meetings to try and get the new design put forward. 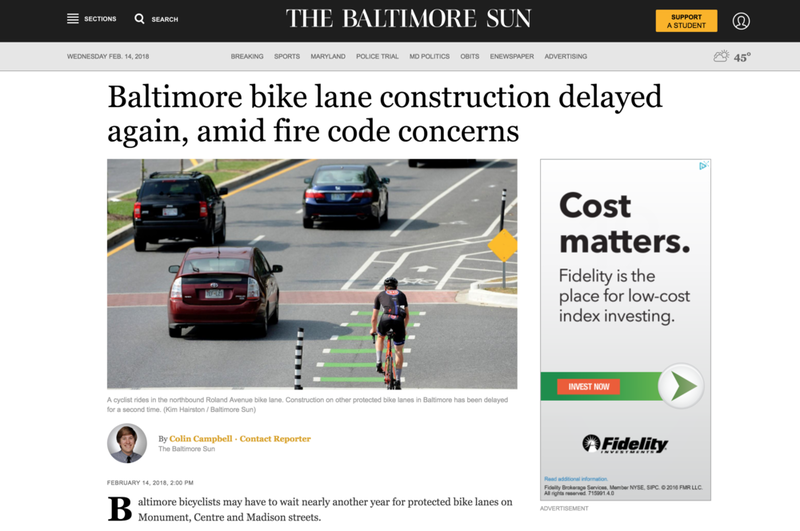 What they leave out is that the plaintiffs in the case were not Bikemore, but our members—members who live in Canton and Highlandtown and rely on the Potomac lane frequently. The secrecy? That’s part of the legal process, one Canton residents were a part of. Our settlement was negotiated under the terms that we would allow the City to engage in a public process moving forward. This was a design put forth by DOT. It did not meet all of our demands, but preserved key pieces that allowed us confidence that the City had taken our concerns into consideration. Anything else is conjecture and hyperbole. It’s about power and nothing more. Next Tuesday it is critical that those who bike and rely on safe infrastructure to do so turn out and demonstrate a commitment to safe streets. We are especially encouraging our members who live in Canton to be represented. We will be following up with many of you individually. That’s how important it is you show up. When you show up, we ask you to speak. Community meetings are tough. Opposition intentionally organizes to make it vitriolic so that it intimidates reasonable people from attending and expressing their views. But we can’t sit idly by and allow our needs to be shouted down. When the time comes to have input, we need you to raise your hand. Get in line to speak. You don’t need to have an eloquent speech prepared. Simply saying, “I’m a Baltimore resident and I support protected infrastructure on Potomac” is enough. To rally supporters we will be out in front at 6:30, handing out stickers to demonstrate your support. We love our city. We want it to work for everyone—no matter how you choose to get around. We believe this design does just that. It’s time we demonstrate strongly that we want choice when it comes to how we get around. Simply planning and designing streets only for cars is something that does not work for the future of Baltimore. And neighbors creating a fortress mentality that believe they represent the whole of a neighborhood, or that those that live in the city and may use that street don’t have a say on what happens on the public right of way is wrong, and the least neighborly way to behave. We can’t begin to express how grateful we are to your action thus far. The donations, the emails, and the phone calls have been what has kept us going. The time is now to demonstrate that we are residents and we believe in a future that provides safe options for all road users. Show up. Speak up. Your city leaders need to hear from you. → More info and updates.